GCOM-W1 stands for Global Change Observation Mission – Water Satellite 1 and is a Japanese Earth Observation Satellite. The Spacecraft is set to examine global water circulation and climate change – monitoring Earth’s health from space. The satellite has been nicknamed ‘Shizuku’ which means drop. 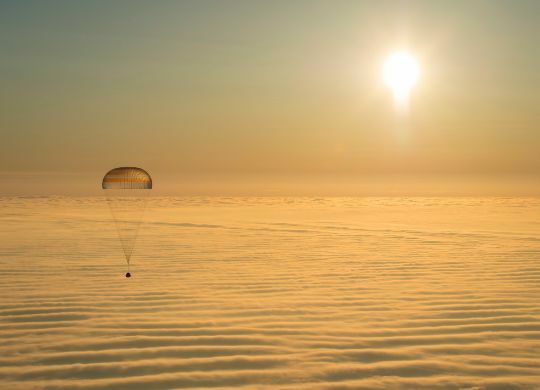 The Spacecraft has a liftoff mass of 1,900 Kilograms. It features two deployable solar array that will supply the instruments with electrical power – generating about 4,500 Watts of power. Shizuku will operate from a Sun Synchronous Orbit with a altitude of 700 Kilometers and an Inclination if 98.2 Degrees. GCOM W1 will operate in orbit for at least five years. 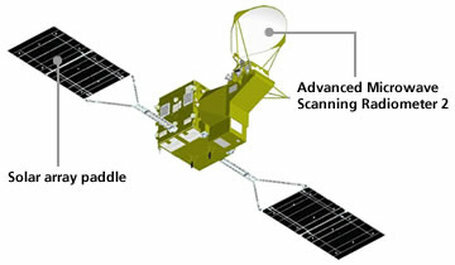 The Shizuku Spacecraft features two main instruments that are used for Earth Observation, the Advanced Microwave Scanning Radiometer 2 and the Second Generation Global Imager. Advanced Microwave Scanning Radiometer 2, or AMSR2, observes water related targets including precipitation, water vapor, sea surface wind speed, sea surface temperature, soil moisture, and snow depth. This is accomplished by measuring weak microwave emission from the surface and the atmosphere of the Earth. AMSR is outfitted with an antenna assembly which rotates once every 1.5 seconds to cover a large ground swath of 1,450 Kilometers. This allows Shizuku to obtain a set of daytime and nighttime data of 99% of Earth’s surface every 2 days. The antenna is 2 meters in diameter and its is 2.7 meters high with its rotating mechanism. The antenna assembly weigh about 250 Kilograms. The instrument acquires microwave radiation emissions in 6 frequency bands ranging from 7GHz to 89GHz AMSR2 is a successor to the AMSR on other satellites including a Japanese Spacecraft and NASA’s Aqua Satellite. AMSR has made significant achievements in monitoring phenomena such as El Nino, La Nina, and sea ice in polar regions. AMSR data has been used for weather prediction and sea state reports by several Japanese Government Institutions. The Second Generation Global Imager is an instrument used for surface and atmospheric measurements of phenomena involved in the carbon cycle and radiation budget, for example clouds, aerosol, ocean color, vegetation, and snow and ice. GCOM W1 will join the A-Train of Earth Observation Satellites. This project is led by NASA and features several different satellites in identical orbits following each other and examining the same area of Earth within a short time period. By combining the data acquired by the different satellites and instruments, scientists are able to gain a better understanding of climate related phenomena. The A-Train allows simultaneous coordinated measurements to gather data on atmospheric components or processes that are happening at the same time. Providing a similar data set by using only one satellite is impossible. One project supported by the A-Train is Hurricane Research.